Well, hello! I hope you had a good Halloween and that you're enjoying all that candy now. Our Halloween was lots of fun. We love Halloween! We carved pumpkins on Friday; we did three this year - one for each of the children and a big one too. The small Bears did theirs almost totally by themselves, using our pumpkin-carving tool set, which has relatively safe saw-like tools and a flat plastic scoop. 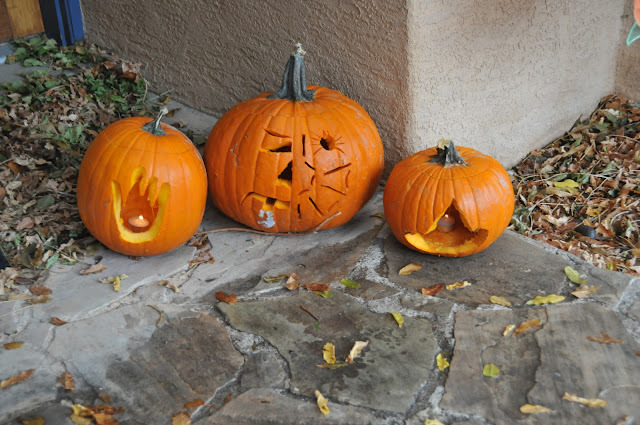 The LB's pumpkin is on the left; it's a hand with three fingers, which is spookier than the normal kind, I'm told. The GB's pumpkin features a witch's hat. The Bear did all the carving on the big pumpkin and it features a scary scene that includes half of a Jack-o-lantern face and half of a spider's web, with spider. A very creative design, I think. I didn't actually carve anything; I stood by providing tool support and taking pictures. I don't love carving pumpkins; the smell bothers me. But I love to watch them do their thing every year. 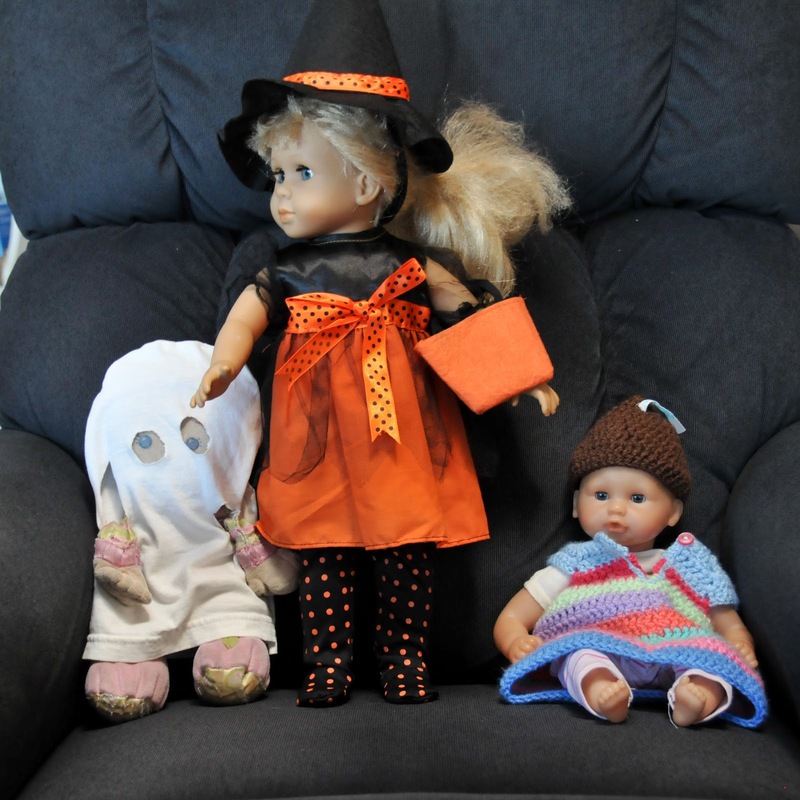 The GB's dolls dressed up for Halloween. The big doll in the middle, Nora, wore her witch costume (it was part of a larger set of outfits Santa Claus brought for the doll last year). Stinker, on the left, dressed as a ghost in a costume that the GB mostly made by herself, hand-sewing it from a piece of the Bear's old undershirt. On the right, Nellie wears a hat I crocheted for her; it's an improvised design that makes her look like a Hershey's Kiss. I added a little white flag with blue "KISSES" lettering at the top. All three dolls were looking sharp, ready for the big night. And then there are these crazy kids. 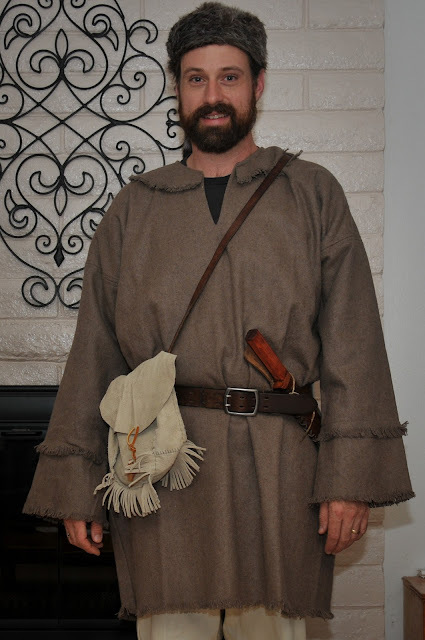 The Bear wore his self-made Mountain Man costume. I have to tell you, I am so impressed with what he did. He sewed his own moccasins from suede and also made himself a "possibles" bag. He made a knife out of wood (for safety) and wore it in a sheath on his belt. His coonskin cap and woolen overshirt were purchased online; he also wore inexpensive painter's pants. He grew out his beard for a couple of months until it reached reasonable Mountain Man proportions of length and shagginess. And he practiced talking like a grizzled old prospector or something similar (which sounds to me a lot like talking like a pirate, but I'm sure they must be related). He got lots of compliments when we went out trick-or-treating. 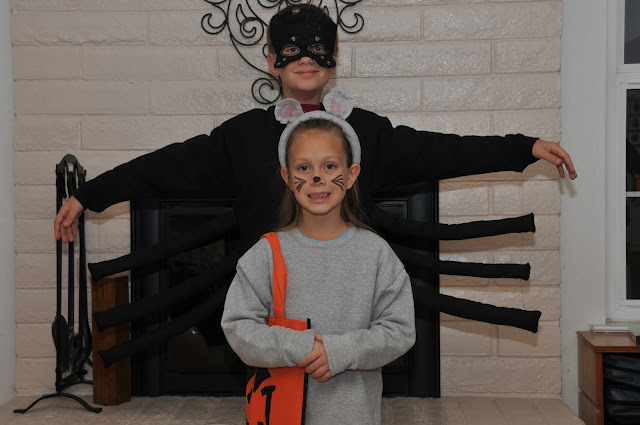 The small Bears wore their spider and mouse costumes again (they still like them and they still fit, win-win). I wore my usual cat ears but I left off the cat makeup this year; I'd just gotten over a breakout and I decided not to tempt fate with heavy makeup on my skin. We had a great night. The kids got tons of candy and we had a lot of fun greeting neighbors and visiting a real haunted house (well, an extremely elaborate front-yard display) on our own street. Halloween rules! I baked my second pumpkin pie of the season this weekend. I've actually been having a hard time finding canned pumpkin in the stores this year. I've heard that there is a pumpkin shortage, due to the current craze for pumpkin-spice-all-the-things. A few weeks ago when I attempted to buy a can, the entire shelf was empty! All the plain pumpkin and all the pumpkin-pie filling mix, gone! I asked an employee about it; he said they can't keep it on the shelves. So I bought two cans the next time they had some. I guess I'm contributing to the problem, but I just can't see myself getting through the fall without pumpkin pie. It's a tradition. Meanwhile, I've been decorating with mini pumpkins in the living room and dining room. I love these little babies. They're cheap and colorful, and they seem to be very plentiful. I've already gone through several of them, unfortunately, because they went moldy on me. I think they'd be better off in a colder environment, but now the heat comes on every day and it's warm and dry in the house. When one looks bad, I just chuck it and replace it. I do find that they get rearranged on their display plate rather often; I think some little girly hands like to move them around. The Bear and I recently had a really interesting night out. I was invited by Dairy MAX, the dairy council representing farmers in New Mexico, Texas, Oklahoma and Kansas, to attend a pop-up celebrity chef event featuring Caitlin Steininger of Cooking with Caitlin. The event was held at a beautiful winery called Casa Rondena, in the North Valley area of Albuquerque, near the Rio Grande. This event was meant to showcase low-lactose foods and recipes, as a way to promote dairy products and make them more accessible to people who have sensitivities to lactose but who want to include dairy in their diets because of its nutritional benefits. I was invited to attend as a local blogger and was given a front row seat to watch Caitlin cook and to hear presentations by nutritionists and other professionals involved with dietary science. The food was amazing; it was a nine-course tasting menu of one delicious dish after another. I want to share a lot more about this experience, which I'll do in an upcoming installment of our podcast (yes, it's coming back!). I don't know if I can do it justice in writing; I think I need to talk (gush!) about it instead. We've been so busy lately. I don't know if I'm coming or going some days, but I love it. I adore the feeling of having places to go and things to do. I also love staying home, as you know, and there's plenty of that too, but we're busy here as well. The small Bears are working hard on schoolwork and learning so much; he's learning about basic rudimentary chemistry, getting started on a project presentation for February. She's learning about the life and work of Georgia O'Keeffe, and creating some lovely floral artwork in O'Keeffe's style. We recently attended a square dance at school, where the LB lost a tooth eating a caramel apple (seconds earlier, I'd exclaimed to the Bear that I hoped I wouldn't pull out my crown, and next thing we knew, a baby tooth had been liberated from the LB's mouth!). I'm plodding along with my holiday gifts and beginning to think I may have bitten off more than I can realistically chew; we'll just have to see what I can get done. Life is good; we're all happy and healthy (aside from a case of sniffles among some of us at the moment), and we're all loving the fall weather and fall fun. I hope you and yours are enjoying the season and doing well too. 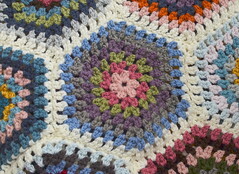 Watch for the next Winter Project Link Party, coming this Friday! 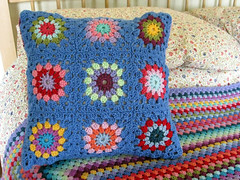 Please join in and share your current projects and show us your progress. I'm so excited to see everyone's work again, and maybe have some new participants too! What a fun filled post! I made a baked pumpkin cheesecake, with the scooped out flesh of Olly's pumpkin. I've never made one before, and it went down very well indeed I followed a recipe that included caramelising the pumpkin seeds to garnish the top. They were very tasty, and went well with the pie. Your family pictures are lovely. My husband loves a bit of fancy dress. Me not so much. I am looking forward to your post about the food tasting event. I think a tasting menu is my idea of heaven. Lots of small plates of gorgeous food. Pumpkin is hard to find here so when I find it I stock up, yes, I guess I'm part of the problem too. Last year we grew pumpkins and I put some up, but this year the seeds never made it in the ground. Love all the Halloween photos, such a great looking family! It's a nice kind of busy... busy when you're enjoying it is exactly where it needs to be. Have fun! Such a happy, busy time of life! 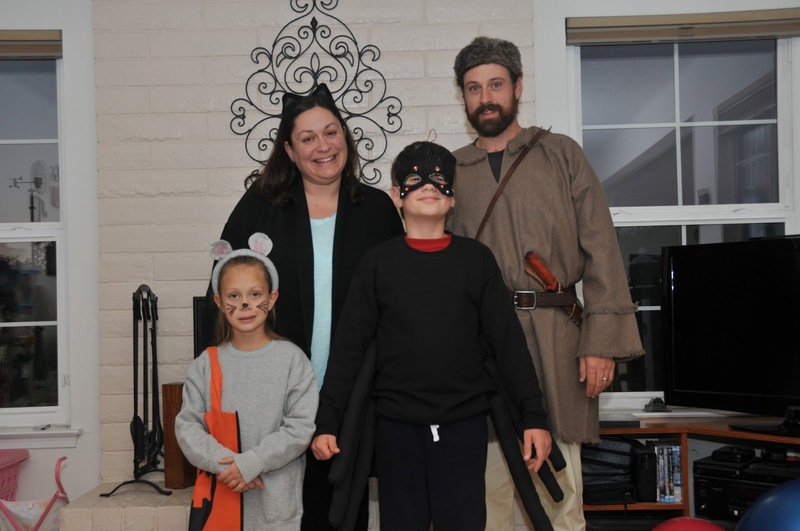 We used to dress up with our kids for Halloween, too. I miss all that! But there are pluses to an empty nest, too! What a lovely family photo of you all dressed up for Halloween, it sounds like you had a great time. I've stopped carving pumpkins since my kids are no longer little but I do love to see all the houses decorated and the trick or treaters dressed in their costumes. As for pumpkins going moldy, you need to spray them with a bleach solution. I'm not sure of the dilution you need but I'm sure you will find out if you Google. What a great photo of you all in your costumes. And the pumpkins look great! I loved seeing all of you together in your costumes. Kudos to the big bear for such a great job on his. :-). I had the same problem with my small pumpkins growing moldy until I followed a suggestion I saw online. Plunge them in a mix of half cup bleach to 1 gallon warm water to kill and mold or bacteria. Let them air dry then spray with polyurethane. I did that weeks ago and mine are doing very well so far. No more mold! I love your posts Jennifer. I put makes me feel part of a family with small ones again. Thank you for sharing with us. Happy Busy is so good. I loved looking at all of your photos. What a beautiful family you all are. It was a very quiet Halloween here. My husband was gone and being way out in the country, we don't have trick-or-treaters. I do miss the days when our kids were little. It was such fun. Thanks for sharing all of this goodness. You all look very cute and I'm impressed with Bears pumpkin carving skills. Glad you had such fun! 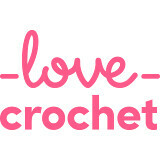 You've gotten some great blogger perks lately - this sounds like an amazing event and I can't wait to hear more. Looks like you all had a great weekend. I've used your quiche recipe a few times now and it's really delicious. Works a treat and a great way to use up my mounting supply of eggs. I usually make two quiches at a time. Your costumes look great and I love the carved pumpkins! A good kind of busy is the best kind of busy isn't it? Such happy busy autumn days, and wonderful family times! Your Halloween looks like a lot of fun and your costumes are great!! Wishing you a happy and busy (in a good way) November, Jennifer! What a fun Halloween you've had! 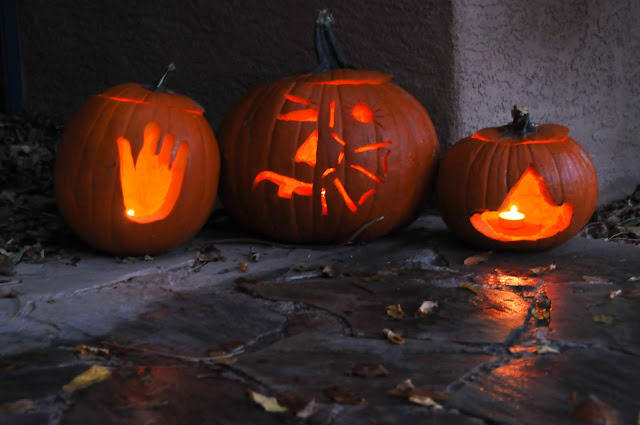 All three carved pumpkins look great and you all look wonderful in your Halloween outfits. Enjoy your week! What fun times and what lovely photo's you've shared, your costumes are amazing - thank you. That pumpkin pie looks yum. We don't tend to make it here in England which is a shame. I remember trying it for the first time over Halloween in California and vowed to learn the recipe. I'll really have to get around to that one of these days. I love the costumes. The Mountian Man idea is brilliant! such a great week, even if days are exhausting, it's great to have things to do and places to go!